Portion Of King Street To Close Friday For Boone Boo! To assist with pedestrian safety and allow for safe and fun trick or treating, a portion of King Street will close on Friday afternoon (Oct 30, 2015) for Boone Boo!. The closure will be from Appalachian to Waters streets from 4:30pm to 6pm. 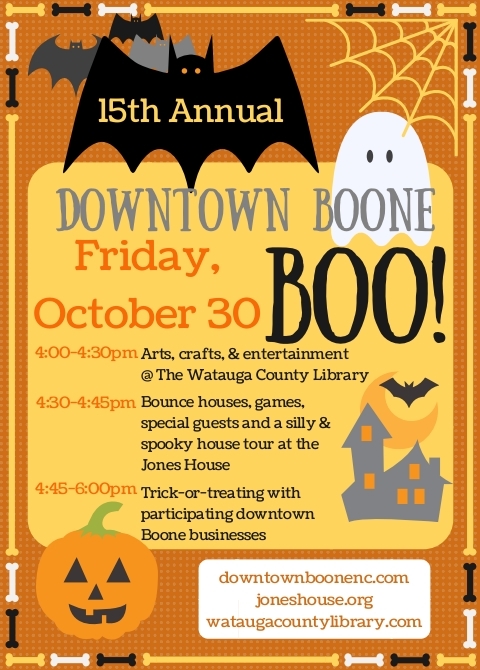 The Downtown Boone Development Association, Jones House Community Center, Town of Boone, and Watauga County Library are hosting the 15th annual Downtown Boone BOO! a family-friendly Halloween event on Friday, October 30 from 4:00 to 6:00 p.m. The fun begins at the Watauga County Library at 4:00 p.m. with arts and crafts and a special magic show with Caleb Sigmon in the Evelyn Johnson meeting room. At 4:30 p.m., children “parade” from the library to the Jones House Community Center for more Halloween fun. Once at the Jones House, families will enjoy a variety of exciting activities. Children may venture through the Jones House for a silly and spooky tour with lots of tricks and treats along the way. Members of the Appalachian State Basketball team will be on hand during the Boone BOO! to pass out candy and sign autographs. This is a great opportunity for children to pick up a free poster and schedule of ASU’s 2015-2016 basketball season and meet their favorite player. For added fun this year, the Fun in the Park activities will be held at the Jones House during the Boone BOO! Children can enjoy bounce houses, play games, win prizes, and adults will enjoy the free give-a-ways provided by the Town of Boone Public Works Department. Organizers also ask for the older Boone BOO! participates to be mindful and considerate of our younger participates when planning their costumes to help ensure a fun, family-friendly event for all. For more information call (828) 268-6280.